← Daily Deal Monkey: Sign Up NOW & Save 50% or More! Those of you lucky enough to reside near a gigantic box in the hue of blue–yes, an IKEA store–will appreciate this pointer on how to stay in shape when getting to the gym just isn’t in the cards. First, dress for the occasion–no tight pants or shirts. Pretend you are going to the gym, but PLEASE leave the spandex at home! 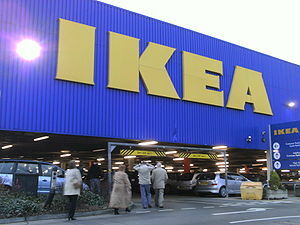 Next, hop in the car and head to IKEA. Forget the list. Nobody goes to IKEA with a list, but everybody leaves with a full cart of STUFF. Once you get to IKEA, grab a shopping cart (not one of those bag holders on wheels–a REAL shopping cart), and LOAD IT UP! Heavier stuff is preferred. Luckily, almost everything is heavy, made-to-assemble stuff at IKEA. Finally, walk briskly with your cart, and do NOT slow down for corners. As you will see, every muscle in your body (especially your core muscles) will fight to prevent disaster as you try to counter the unique design of IKEA carts–ALL 4 WHEELS are directionally variable, not just the front wheels like at the grocery store. Grocery store carts are for sissies. No wonder there are no fat women in Sweden! This entry was posted in Off the Wall and tagged core training, exercise, gym, health club, humor, IKEA, shopping, shopping cart, workout. Bookmark the permalink.